The prevailing climatic conditions of a building site define the overall preconditions for the daylighting design in terms of sunlight availability, visual comfort, thermal comfort and energy performance.Figures 1.5.2 to 1.5.4 show the effect of climatic conditions on the sky luminous distribution and intensity. 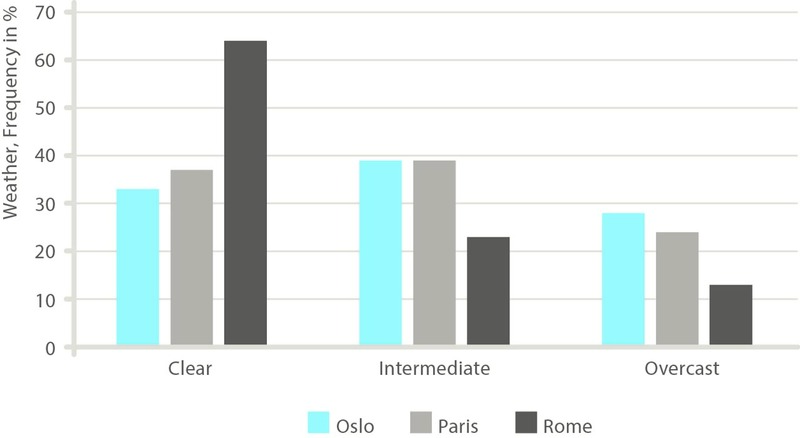 exceeded for 35% of working hours (8-17) in Oslo, but 65% of the time in Rome. ​Figure 1.5.1 Frequency of weather in % for three different European cities. Figure 1.5.2 Luminance map of a clear sunny sky. The image above describes a clear sky luminance distribution. Under clear sky conditions, the sky luminance is about ten times brighter at the horizon than the zenith. In addition to the sky luminance is the sun luminance.The sun acts as a dynamic light source of very high intensity. ​Figure 1.5.3 Luminance map of an intermediate sky. The image above describes an intermediate sky luminance distribution. In this particular case, the sun energy has been scatteredby the clouds, which results in a softer transition between the very intense luminance of the sun and the luminance of the sky. It is possible to observe that the clouds (illuminated by the sun) have higher luminance values than the sky. ​Figure 1.5.4 Luminance map of an overcast sky. The image above describes an overcast sky luminance distribution. Under perfect overcast sky conditions, the sky luminance is the same in all orientations, and the zenith isabout three times brighter than the horizon. The latitude of a building site determines the solar altitude for a given time of day and year. 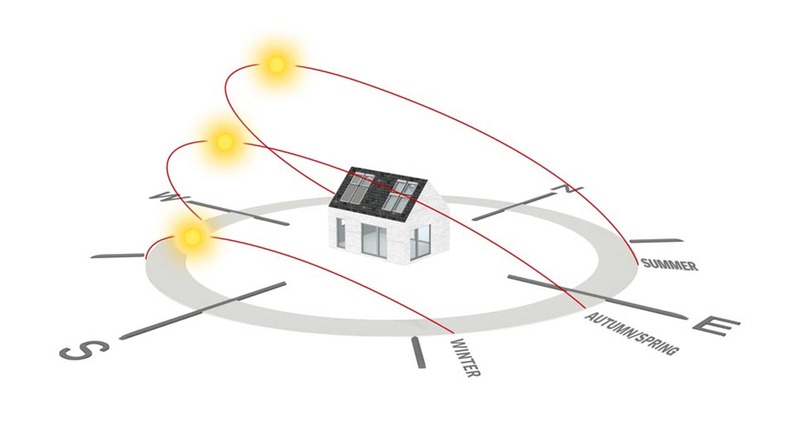 The summer and winter solar altitude properties for a specific location are important design inputs for the control of direct solar radiation. Latitude will also determine the length of daytime and solar availability at different seasons of the year. Maximum and minim solar elevation will depend on the latitude of the site; on moving away from the equator towards north or south, the difference between summer and winter becomes greater as latitudes increase. Figure 1.5.5 show the difference in outdoor illuminance between northern and southern European locations. The highest peak of global illuminance is during the summer (for the northern hemisphere), when the sun is at its highest level, and about two and a half times greater than the lowest peak during the winter, when the sun is at its lowest level. ​Figure 1.5.5 Global illuminance in northern and southern European locations. External reflections and obstructions from surrounding elements on the building site (buildings, vegetation, ground surface etc.) will influence the amount of daylight reaching the interior of a building. ​Figure 1.5.6 Components of view – roof window situation. Figure 1.5.7 Components of view – facade window situation. The following figure show the effect of obstruction on daylight availability in a simple room with a vertical facade window, and the effect of adding a flat-roof window to deliver day light deeper into the obstructed room. The results show that obstruction can greatly affect the amount of daylight that will reach the building interior, and how adding an unobstructed window on the roof can provide much more daylight. Measures like light shelves and reflective ceilings can improve the light distribution from the facade slightly, but these solutions are often associated with visual discomfort. The most effective way to bring daylight deeper into buildings is to use light from the roof with products like VELUX roof windows and sun tunnels. 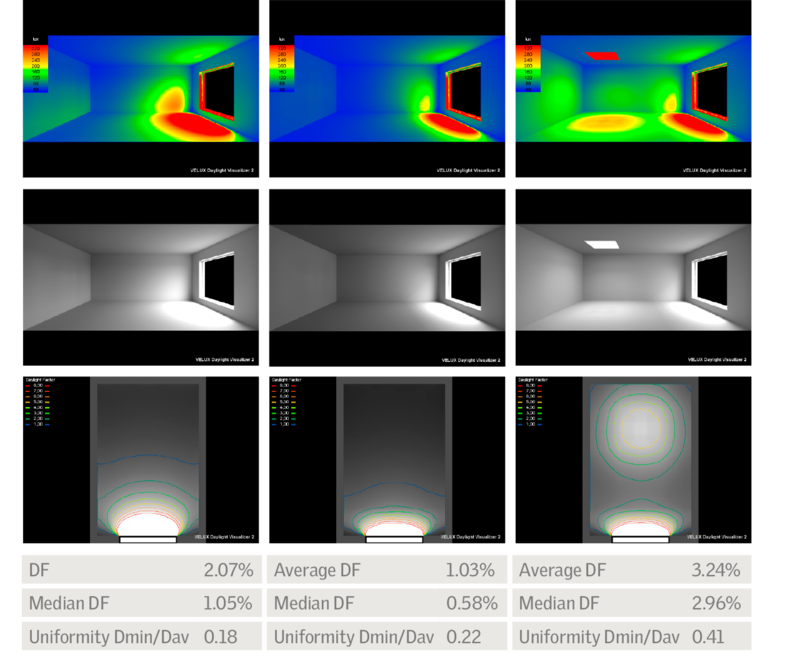 The simulations below demonstrate the daylight performance of a deep room with three different window configurations installed. 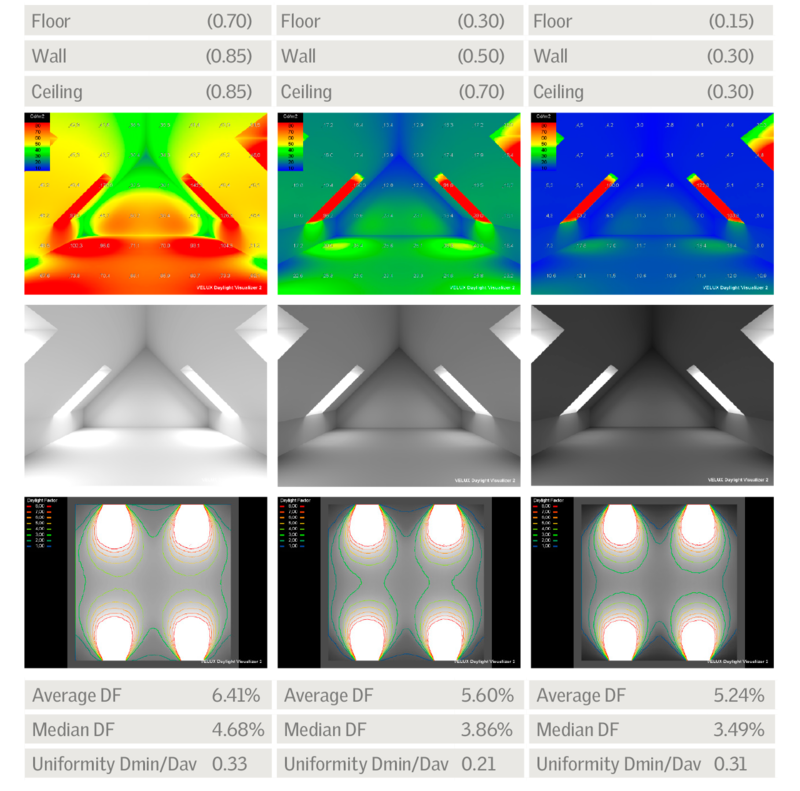 Surface reflectance: 0.35 (floor), 0.66 (wall), 0.90 (ceiling). 1) Situation with 10% glazing to floor area ratio (facade window only). The results from scenario 1 show that a 10% glazing to floor area ratio will only achieve a DF of 2% a few metres from the facade and leave the back of the room with very low light levels. Even though the average DF of the room is equal to 1.9%, only a small work plane area achieves values above 2%, and only one of the three workplaces represented can be considered daylit. ​Figure 1.5.9 Luminance and daylight factor simulations of scenario 1. 2) The situation with 30% glazing to floor area ratio (facade window only). The results from scenario 2 show that a 30% glazing to floor area ratio will achieve a DF facade of 2% approximately 4.5 meters from the facade. The DF average is equal to 5.1%, but it is highly nonuniform and not well distributed over the work plane area, with very high values near the window and low values at the back, a luminous environment likely to cause visual discomfort and glare. In this scenario, two of the three workplaces represented can be considered daylit. ​Figure 1.5.10 Luminance and daylight factor simulations of scenario 2 and 3. 3) The situation with 20% glazing to floor area ratio (11% facade window + 9% roof window). The results from scenario 3 show that a combination of facade and roof windows with a 20% glazing to floor area ratio provides generous and useful DF levels over the entire work plane, within average DF of 6.4%. The results demonstrate that the use of roof windows means better daylighting performance and a luminous environment not as likely to cause glare and visual discomfort.In this scenario, all of the three workplaces represented can be considered well daylit.Simulations performed with the VELUX Daylight Visualizer. CVP VELUX roof windows are used in scenario 3. The colour and reflectance of room surfaces are part of the lighting system.Dark surfaces reflect less light than bright surfaces, and the result is likely to be an unsatisfactory luminous environment in which there is little in director reflected light. Bright vertical surfaces inside the room are generally preferred to dark ones, but shading devices used to control sunlight should use darker materials in order to limit the risk of glare (e.g. grey awning blinds). 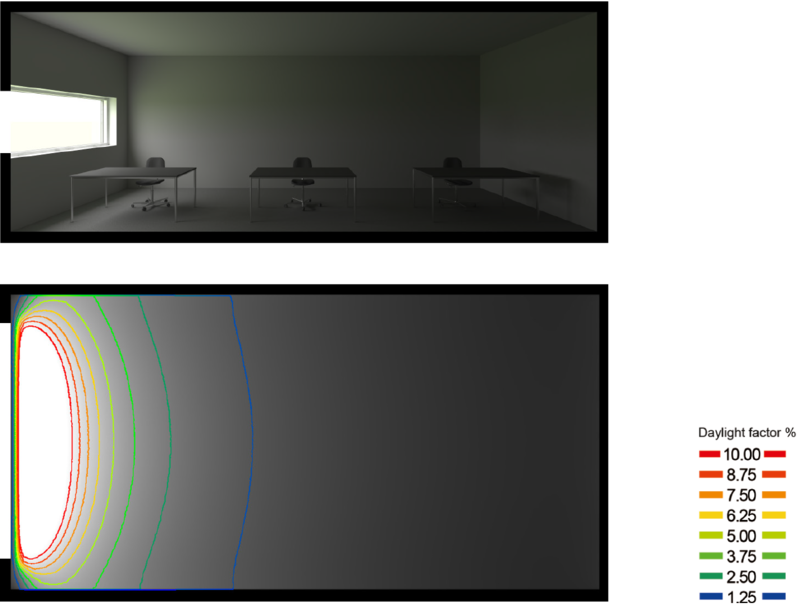 ​Figure 1.5.11 Luminance simulations showing the effect of surface reflectance on daylight levels. Figure 1.5.12 A diagram showing the sun's paths on the winter solstice (shortest day), the equinox (day and night almost equal) and the summer solstice (longest day). The amount of daylight entering a room is linked to the total glazing area of windows in that room. The amount of daylight transmitted through a window pane is reduced by the number of glass layers it has to penetrate.As a rule of thumb, double glazing(with no coating) lets in approx.80% of the light, while triple glazing(with no coating) lets in approx. 70%of the light (compared to an open window). Coloured or coated glass can reduce the visible transmittance of a window pane to values as low as 20% and significantly modify the spectral quality of the transmitted light, as well as the perception of surface colours in the interior. Shading and sun screening are just as important to good daylighting performance as the window itself. Pleated blinds and Venetian blinds can be used to adjust the amount of daylight entering spaces and to reduce window luminance to control glare. 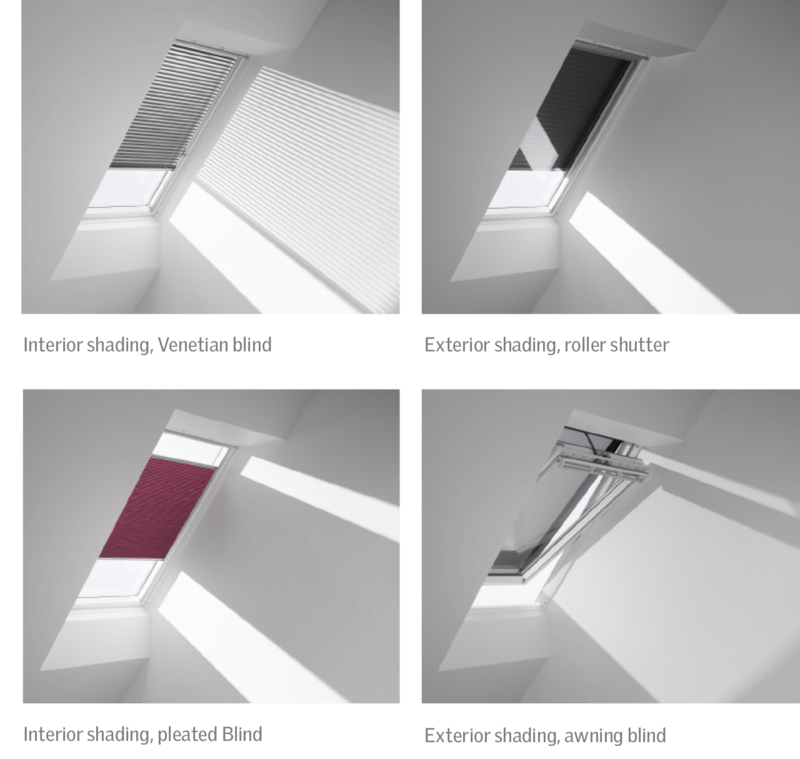 The Venetian blind can also be used to redirect the light into the room. The most efficient shading solution to prevent direct solar radiation into the building is to use external shading. Examples of external shadings are roller shutters and awning blinds. A dark grey screen (VELUX awning blind 5060) will reduce the illuminance and luminance levels significantly to a level where the risk of glare is avoided. Figure 1.5.13 Different shading solutions. As a rule of thumb, double-layer glazing transmits approx. 80% of the light and triple-layer glazing transmits approx. 70% of the light. Coloured or coated glass can reduce the visible transmittance of a window pane to values as low as 20%. The positioning of windows will influence the distribution of daylight in the room and determine the amount of 'useful' daylight. Window position should also take into account the relation between the view to the outside and the eye level of the occupants. The geometry and depth of window linings will influence the amount of daylight entering the room and can be used to soften the luminance transition between the high luminance values of the window and the surfaces of the room. 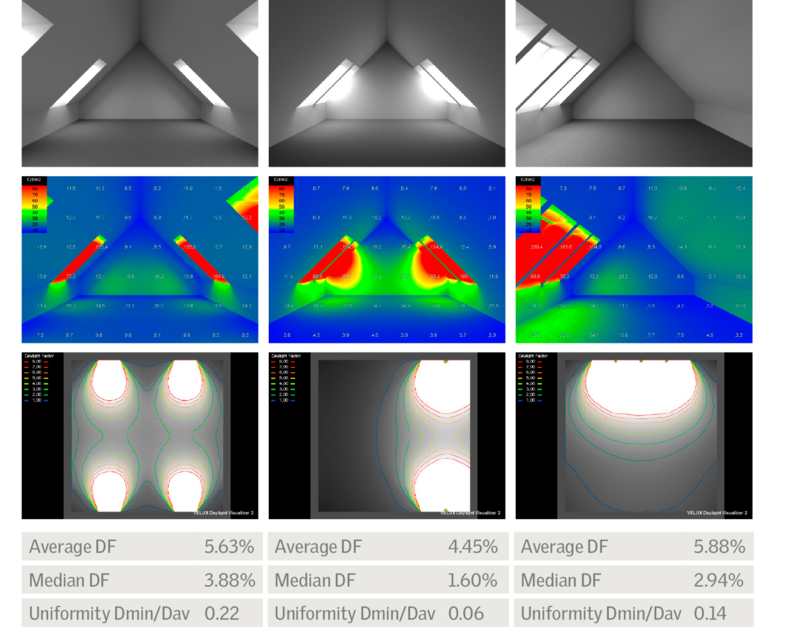 The figure below shows the effect of different window position in an attic with four roof windows.The results show that the average DF values vary in the room, but not as much as median DF values, which are a better representation of the useful amount of daylight in the room. It is also worth noting the effect of window placement on the uniformity of daylight in the room and taking it into consideration in the building design and window layout. Orientation is a crucial factor influencing Sun Tunnel's performance. These products are intended to transport intense sunlight to diffuse it into useful daylight in deep areas of buildings or areas where a window is not necessary but daylight is wanted. Sun Tunnels should be oriented to maximise their exposure to direct sunlight. The length of a Sun Tunnel influences the number of inter-reflections needed for sunlight to reach the interior of room. While shorter Sun Tunnels will deliver more light, the very high reflectiveness of the metal material used in them allow sunlight to be efficiently transported over long distances up to 6m. Rigid Sun Tunnels will deliver more light than flexible Sun Tunnels. The amount of daylight entering a room from Sun Tunnels is linked to the dimensions of the product. The transmittance and optical properties of the diffuser influence both the amount and distribution of daylight from Sun Tunnels. 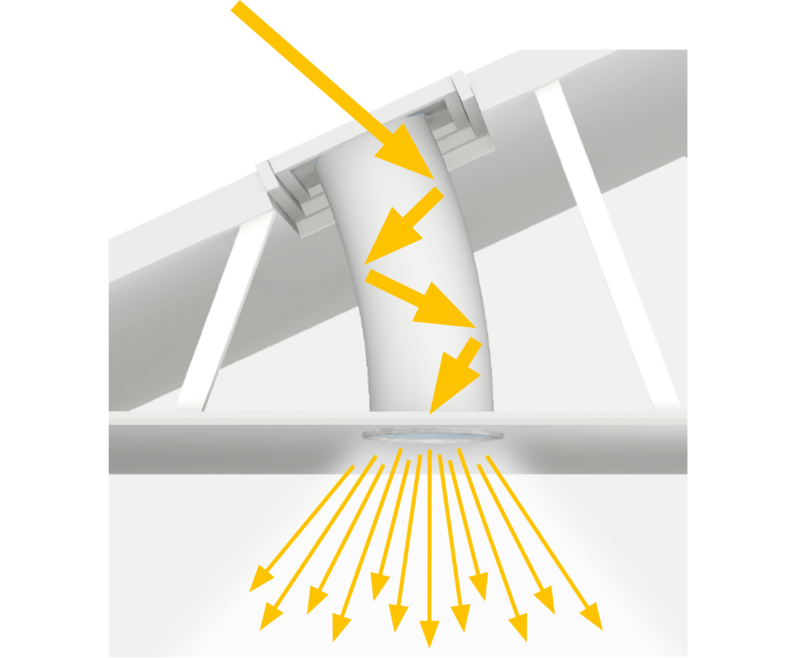 As the name suggest, the diffuser takes the direct sunlight coming down the Sun Tunnel and diffuses it to achieve a good distribution of daylight in the room. ​Figure 1.5.14 Diagram showing sunlight transport in Sun Tunnels.